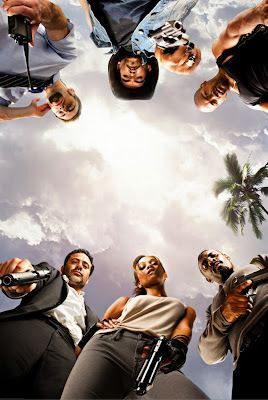 "The Losers" stars Zoe Saldana (Avatar), Jeffrey Dean Morgan (Watchmen), Idris Elba (RocknRolla), Columbus Short (Armored) and Chris Evans (The Fantastic Four) and is directed by Sylvain White (Stomp the Yard). Peter Berg penned the screenplay along with James Vanderbilt off of Andy Diggle's 32 issue comic. "The Losers" blasts into theaters April 9th. 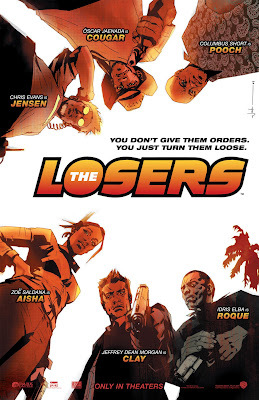 Updated: The Los Angeles Times recently debuted an article in their Hero Complex division that aims to try and set "The Losers" apart from the closely related commando mission film "The A-Team" which releases two months after "The Losers." Attached to the article is a promo shot of the cast that mirrors the Teaser poster (sans Saldana and Morgan's placement). Below I have the new promo shot and the original teaser poster for you to see for yourself. Take a look. Does Zoe Saldana's placement change in the poster have anything to do with Avatar's success? Does the average film goer even know that Saldana is in Avatar?